We’d love your help. 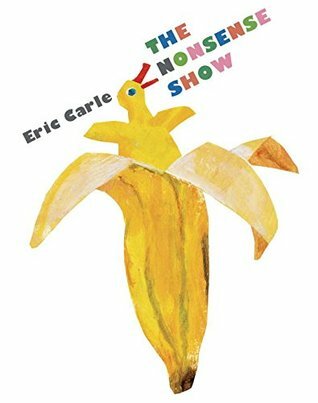 Let us know what’s wrong with this preview of The Nonsense Show by Eric Carle. jumpe Ducks growing out of bananas? A mouse catching a cat? What’s wrong with this book? To ask other readers questions about The Nonsense Show, please sign up. This book is just about absurd things. A rabbit pulls a human from a hat. A bird flies underwater while a fish lives in a birdcage. A kangaroo has a human child in her pouch. A two-headed snake (has no tail). Etc. etc. A tennis player hits an apple instead of a tennis ball and ends up with applesauce on her face. Some of it is freaky, like when the horse and the human woman decide to trade heads. Some of it is whimsical, like when fluffy sheep come out of a steam engine instead of puffs of steam. It's t This book is just about absurd things. It's told in rhyme, but I don't think the rhymes are particularly good. First and foremost, I am probably biased because I am a huge fan of Eric Carle. We have so many of his books and my children love his illustrations and we never tire of his wonderful stories. When this book showed up at my house my kids got SO excited. We read it immediately and my kids loved it. The great part is that we recognized so many things from some of his other books and as usual, the illustrations were on spot. As an extra bonus, I decided to read it to three first grade classrooms who First and foremost, I am probably biased because I am a huge fan of Eric Carle. We have so many of his books and my children love his illustrations and we never tire of his wonderful stories. When this book showed up at my house my kids got SO excited. We read it immediately and my kids loved it. The great part is that we recognized so many things from some of his other books and as usual, the illustrations were on spot. As an extra bonus, I decided to read it to three first grade classrooms who are actually celebrating Eric Carle as their author of the month and these kids were SO excited to see the book, read it with me, and talk about why each page was silly. The children were all laughing, they liked how the book had lots of opposites (the lion taming the people, the rabbit pulling a man out of the hat, etc), and their favorite was the duck with human feet and the horse/human switching heads. Basically an extended drug trip. Love the illustrations of course, but as for the rest, you can probably count me in among those who "just don't get it." Odd - some re-hashing of older art with new things and total nonsensical text. Odd. Too terrifying to ever read to a child, but reading it for myself, I have to say I loved the art. I would consider buying to have as a coffee table book to start conversations. The thing about surrealism (for me, at least) is that it needs to be done in small doses. Stick a Magritte in with a whole bunch of Renaissance masters and it stands out, and inspires discussion, and elicits emotion. But when you put a whole bunch of surreal pictures right in a row, with narration that makes no sense, it becomes overwhelming. It becomes stressful. I feel like Eric Carle was trying SO HARD to teach people about surrealism, but instead we ended up on a bad drug trip. If I were goin The thing about surrealism (for me, at least) is that it needs to be done in small doses. Stick a Magritte in with a whole bunch of Renaissance masters and it stands out, and inspires discussion, and elicits emotion. I feel like Eric Carle was trying SO HARD to teach people about surrealism, but instead we ended up on a bad drug trip. If I were going to teach the kiddos about surrealism as an art movement, there are other books I'd choose first. If I wanted to introduce the kiddos to the idea of explaining what you see, and dissecting what is unrealistic...I'd do it without the text accompanying the pictures. Not one of my favorite Eric Carle books. I didn't love the rhyme scheme. My second favorite of Eric Carle. Don't we just love this kind of upside-down humor? I love Eric Carle's iconic watercolor artwork. The pictures of "nonsense" were fun and bright to see. Plus, the book gets kids to use their imaginations, looking at made up scenarios. 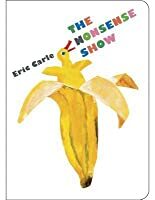 Since I just reviewed an Eric Carle book, I thought I would follow it with his latest. THE NONSENSE SHOW is totally crazy and wacky! It exudes nonsense and imaginative voice. The book jacket labels the work "nonsense and surrealism," sparking "creativity and imagination." I looked up the definition of "surrealism" and found that it means "to feature the element of surprise, unexpected juxtapositions and non sequitur." Then I looked up non sequitur to make sure I understood what I was about to say Since I just reviewed an Eric Carle book, I thought I would follow it with his latest. THE NONSENSE SHOW is totally crazy and wacky! It exudes nonsense and imaginative voice. The book jacket labels the work "nonsense and surrealism," sparking "creativity and imagination." I looked up the definition of "surrealism" and found that it means "to feature the element of surprise, unexpected juxtapositions and non sequitur." Then I looked up non sequitur to make sure I understood what I was about to say in this review: non sequitur means an inference or a conclusion that does not follow from the premises; a statement containing an illogical conclusion. Every double page is full of silly characters--people or animals acting in reverse of what we would imagine. Silly things are said that just don't make much, if any, sense at all. It is just plain CRAZY!! Eric Carle's wonderful art is at its usual best--colorful, bright, bold, and wonderful. 2016: This was a seriously weird book. My seven-year-old was not impressed by it. But I think we should all make room for a little nonsense in our lives. I'm guessing my daughter was just a little too old to be captivated by the contradictions. A four-year-old would get it. 2019: I was so right. My four-year-old picked this book out at the library and adored it. I still don't love it but it is just right for four-year-olds. Not a favorite. With the exception of a couple of pages that reminded me of good silly poems, most of this seemed like illustrations where the words were added as an afterthought to fit the silly story. I think kids will like this though, because it will make them laugh. I just wish the writing were as good as the illustrations. This is a sad day, when I am left with a one star for the incredible & wondrous Eric Carle. I'd like to say the illustrations are worthwhile, but once I came to a spread featuring a horse with a girl's head, there was no hope. I understand what Carle is doing, with his jabs of nonsense, but this is a miss & clearly only published because he is who he is. Not recommended. At first I was going to dock this for uneven rhyme meter, but then I realized IT'S A NONSENSE BOOK, so it's okay. Eric Carle gets out his crazy for this one and I love it. The baby liked the weird pictures, and would honestly probably give it two stars. She especially liked the half of a body chasing the other half. Maybe even three stars. But as her mother I can't give more than one star to this nightmare fever dream of a book. It's supposed to come off as 'whimsical' and 'fun' but is really freaking horrifying. The giant mouse chasing a cat, a rabbit pulling a man out of a hat, and all in that unique art style of Carle. I don't even know what's going on in the last page, I'm pretty sure that's a dead body. I like this book because there's lots of silly things, and if you see this rabbit you'd think it was in the hat, but the rabbit's doing the magic trick and the person's in the hat. And as you see in the cover, instead of an egg, there's a banana peel, and inside of the banana peel, there's a duck. 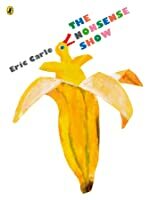 Ducks usually go in eggs, and not in banana peels and that's why it's called The Nonsense Show. And like most ducks they have webs feet, instead of regular feet without webs like we do, like people do. I kind of thought this book was nonsense, sorry! I asked the kids what they noticed about the illustrations, and they were able to tell me it looked like The Very Hungry Caterpillar. From there, all similarities ended. This was almost grotesque at times... too avant garde for the targeted demographic in my opinion. 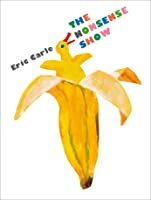 Eric Carle is particularly famous for one picture book, the Very Hungry Caterpillar - but he is the author of numerous other books and this his one of them - and it is stuff and nonsense as the title suggests and a lot of fun. It is good too read something else by him, to see beyond the caterpillar and this is a good read which young readers would enjoy. I've read this to several grades. PreK weren't into it. I have found that they can be very literal, so books like this annoy them. Kindergarten enjoyed it, but spent way too much time explaining the jokes to themselves. First grade LOVED IT. They went absolutely nuts for it! First of all, I love Eric Carle’s books. My 18 month old grand loved the vivid drawings and the topsy turvey world Eric created. It was amusing and was read many times over. This one got some giggles. I love Carle’s work, but this title just didn’t do it for me. The kids thought some of the illustrations were funny, but I found the narrative clunky. The book just didn’t flow. Literally a book of non sense so true to the title. This is a very fun, cute, silly book... but of course, it's called "The Nonsense Show." The more Eric Carle books I read, the more I believe that The Hungry Caterpillar is famous due to the unique way the book is laid out, not due to its illustrations or writing. It was about humans getting mixed with animals. I thought it was funny HAHAHAHA!